So exactly which bus do you need to take to go to Myeongdong once you arrive at Incheon International Airport? 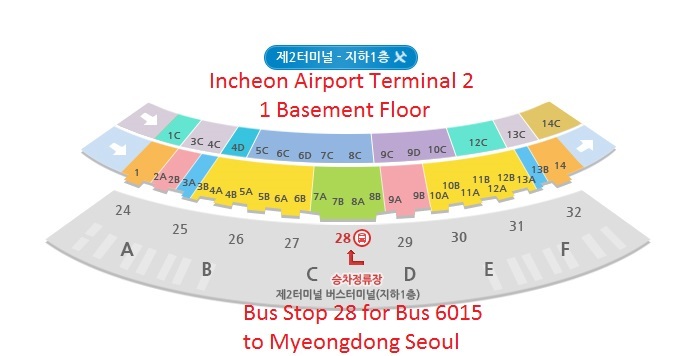 You can catch bus 6015 at either TERMINAL 1 PLATFORM 5B-1 of outside the arrival hall (1st Floor) of Incheon Airport or the new TERMINAL 2 (T2) 1 basement floor PLATFORM NUMBER 28. 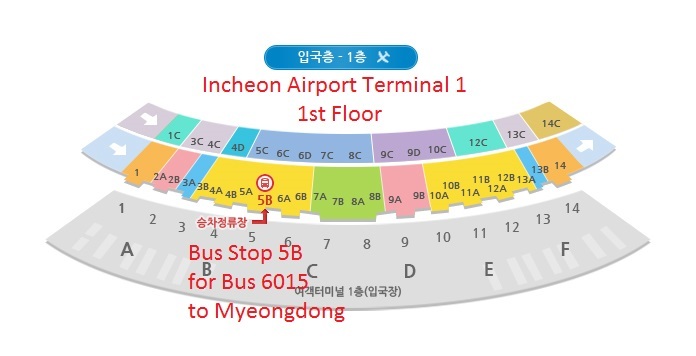 The location of bus 6015 bus stops at Terminal 1 and Terminal 2 are shown below. The bus seats are comfortable. There are spaces on the bus for your to put your luggage. So don't worry if you have some luggage with you. The bus is specifically catering for passengers from the airport. A one way ticket for Bus 6015 from Incheon Airport to Myeong-dong costs KRW 15,000 (approx US$13). This ticket can be bought at the ticket booth inside the arrival hall (1st Floor or terminal 1 or terminal 2) . At Terminal 1 for example, after you get out of the arrival halls, you can buy the ticket at the ticket booths near Gates 4, 6, 7, 8, 11, 13, and gate 9C. Just tell the ticket booth that you want a ticket for bus 6015 to Myeongdong. The ticket booth looks like this. There is a Bus 6015 departing from Incheon Airport to Myeongdong every 20 to 35 minutes. The waiting time is maximum 20 minutes during peak hours. The first bus departs from Incheon to Myeong-dong at 5:25am (Terminal 2) and 5.45am (Terminal 1) in the morning while the last bus departs at 10:55pm (Terminal 2) and 11:15pm (terminal 2) in the evening. The journey from Incheon Airport to Myeong dong takes about 1 hour 30 minutes, depending on downtown traffic condition. Good news for those who choose to stay at Hotel PJ and Nine Tree Hotel in Myeongdong. Bus 6015 will take you from Incheon Airport to Hotel PJ and right to the front of Nine Tree Hotel. The station name is exactly "Chungmuro Station" for Hotel PJ and "Myeongdong Station" for Hotel L7 Myeongdong by Lotte, Myeongdong Skypark 3 Hotel, Nine Tree Hotel, Prince Hotel, Sejong Hotel, and Loisir Hotel Myeongdong. In addition, Bus 6015 also stops at Ibis Myeongdong, Royal Hotel, Best Western Gukdo and Hotelbiz and Tmark Hotel Myeongdong. Announcement will be made before and when the bus arrived at each bus stop. Hotel PJ is a new hotel at Chungmuro Station while Nine Tree Hotel and Myeongdong Skypark 3 Hotel are new hotels near Myeongdong Station. These hotels are always full because of their strategic locations at the bus stations. Personally, I prefer Nine Tree Hotel which is behind the "Myeongdong Station". NOTE: Since 19 September 2014, Myeongdong Station has moved downward 70 meters from in front of Sejong Hotel (Exit 10 Myeongdong Subway station) to the new location below now in front of Nine Tree Hotel (near Exit 8 of Myeongdong Subway Station). NOTE 3: If you plan to go to N Seoul Tower, you can walk there by walking into the alley behind EXIT 3 of Myeongdong Station (circle 3 in the map above). Book admission ticket online for more than 15% discount over normal counter price. Bus From Myeong-dong to Incheon Airport? Yes, you can take the same bus (6015) from Myeong-dong to Incheon Airport. The first bus departs from Sejong Hotel (Myeongdong station) at 4:50am in the morning while the last bus departs at 8:35pm in the evening. If you prefer not to take bus, you can use the AREX train and Seoul Subway to travel between Incheon Airport and Myeong-dong. Otherwise, you may also taken taxi from Myeongdong to Incheon Airport. The taxi fare / rate is about the same as from Incheon airport to Myeongdong, whcih is approximately 65,000Won (plus 7,700Won toll). All said, shuttle bus 6015 is still the most preferred way for many tourist because it is a cheap, reliable and convenient way to go from Incheon Airport to Myeongdong or from Myeongdong to Incheon Airport. There are three ways to get to Myeongdong from Incheon Airport: by bus, AREX train and Taxi. In this post, we will guide you on how to take a bus from Icheon Airport to Myeongdong. Bus is the most economical and convinient way to get to Myeongdong from Icheon Airport. We rate AREX train second for the reason that you need to change line from AREX to Seoul Metropolitan Subway at Seoul Station. Taxi / Airport Van Transfer is the most convenient and as cheap as bus if you travelling in group of 4 to 7 people. This very helpful! Thank you so much for the information! I'll be in Myeongdong this March2014 and we are staying at Guesthouse the hill... Looking forward for more posts! Is the alighting and boarding stop the same to and fro airport/station?can I buy round tkt for to and fro? Hi, if we want to take the bus from Sejong Hotel to airport, where do we purchase bus tickets? Hello Janessa, you can buy the ticket with cash when you get on the bus at Sejong Hotel Myeongdong. Hello if we want to get to IBIS MYEONGDONG HOTEL,where bus station we must get off from the bus ? Hi dutunk, Good choice. Get off the the bus at Ibis Ambassador Myeongdong. The station is right in front of the hotel lobby. Hi! Thank you for this useful information! Question, does the 6015 pick up passengers only at the incheon airport stop or does it pick up passengers at any stop on the way to myeongdong? Hi Lisa, Bus 6015 pick up passengers on the way to Myeongdong too. Hi nataliejilllim, for Savoy Hotel Myeongdong, you should get off the Airport bus 6015 at "Myeongdong Station", which is located in front of Sejong Hotel. You need to walk for 5 to 10 minutes (downhill, shouldn't be difficult) from the station to Savoy Hotel. Refer to the direction in the Google Map below. Hi, if we want to get to HOTEL SKYPARK Myeongdong 1, which bus station we must get off from the bus? Thank you. Yen Wan, you can get off bus 6015 at "Myeongdong Station" too (located in front of Sejong Hotel. There is a bit of walking though. Hotel Skypark Myeongdong 3 is nearer to this station if you haven't booked. I have been told I must stop at Euljiro Ib-gu, are the stops advertised on a screen on the bus? The bus will play an announcement before each stop (usually in Korean, Japanese, Mandarin and English). Just press the bell when the stop you want to get off is being announced. which stop to take if we are staying at Hotel Aventree Jongno? and how far do we have to walk? 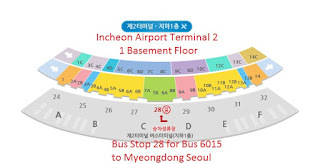 Hi Rea Reyes, if you are staying at Hotel Aventree, it would be better to take Bus 6005 to Insa-dong from the airport and get off the bus at Insa-dong Hotel Aventree Station. Hi xaver, you can buy the ticket on the Airport Shuttle Bus itself with cash. Can I pay using T-Money instead of buying the ticket from A/port? Yes, you can use T-Money card instead of buying the ticket from the Airport. You can buy your T-Money card from the convenience stores in Incheon Airport before taking the bus to Myeongdong. I'll live in Vestin Residence at 19-1 Namsan-dong 3ga, Jung-gu, Seoul. Which stop should I get off ? What's the walking direction towards this hotel? Any nearby shop around the hotel? You should get off the bus at Myeongdong Station too. Take the zebra crossing to cross the main road. Turn left at the end of Zebra cross and walk straight (slightly uphill). You should see Prince Hotel on your right. Continue to walk for about 40 meters and turn right into a street Toegye-ro 24-gil. Walk straight for about 70 meters (slightly uphill) and look for Vestin Residence on your right. There are shops around the hotel but there are a lot of shops across the main road (behind where the bus drop you off) at Myeongdong shopping district! Hi, arriving after 11pm would means late for the last bus , how much is the fare for the AREX train and where can I buy tickets? Also can you give me an estimate of taxi fare to myeongdong? will be arriving on 28Oct. Thank you. However, you can still take the all stop train to Seoul Station that stops at all stations on the way instead of AREX which is non-stop to Seoul Station. The journey takes about 53 minutes. The last train depart Incheon Airport at 11.42pm and arrive at Seoul Station at 12.38am. The fare is 3950 Won. After arriving in Seoul Station, change to Line 4 to go to Myeongdong Station which is only 2 station away from Seoul Station. The last train depart Seoul Station Line 4 to Myeongdong Station at 12:44am. For taxi from Incheon to Myeongdong the estimated fare is 53000 Won approximately. After midnight, mid-night fare is applicable (62500 Won approximately). We'll be staying in Astoria Hotel (13-2, Jung-gu, Namhak-dong, Seoul, South Korea) andwe were told to take the 6015 bus. What bus stop should we get off on and how fo we get to the actual hotel? Also, how much would a regular taxi cost from the airport to the hotel? The bus stop to get off the bus is also Myeongdong Station too. From the station, use the zebra crossing to cross the main road and turn left. Walk along the main road (slightly uphill for about 600 meters (crossing a big junction on the way) before you arrive at Astoria Hotel. The regular taxi from Incheon airport to Myeongdong is about 53000 Won but with traffic congestion and toll the total could be up to 75000 Won or even 80000 Won. Hi, if we want to get to Metro Hotel, which bus station we must get off from the bus? And if I have 2 big luggage there is no problem right?Thank you. Hi, any idea which bus stop to alight? tks. You can alight at Ibis Ambassador Myeong-dong. Metro hotel is one block behind this hotel (about 100m). Can I know which bus stop to alight for Skypark Hotel II? Any signs I can watch out for to know its almost time to alight? You can alight at Myeongdong Station. The next stop of the bus will be announced in English, Korean and Chinese. So don't worry about that. There is a bit of walking from Myeongdong Station to Skypark Hotel II. Actually, the better choice is Skypark Hotel III which is just next to Myeongdong Station (exactly at Exit 9, Myeongdong Subway Station). For Skypark Myeongdong II, it might be nearer if you alight the bus at Ibis Ambassador Myeongdong, instead of Myeongdong Station. Skypark Myeongdong II is behind this hotel, about 200m. Hi, how do I get from incheon to ekonomy hotel myeongdong premier n the direction to the hotel? How about from Hongdae hongik uni station back to Incheon Airport? Appreciate your help and thank you very much. It is the same as in this article. Just take bus 6015 from Incheon Airport and get of at Myeongdong Station. After get off the bus, walk a few steps in down hill direction and turn right into the street before EXIT 8 of Myeongdong Subway station. Walk along that street and turn left at the first cross junction. Walk straight for about 40 meters to get to ekonomy hotel myeongdong premier. Hongdae hongik university station is one of the station on the Airport Railway (AREX) line. You can take train from this station directly to Incheon Airport. Hi! Just want to know if it will be necessary to indicate at the ticket booth which stop we would alight or we can alight at any stop for the ticket that would be purchased? Not necessary. The price is the same. The next bus stop will be announced along the way. We will be staying at Grand Field Residence near Myeong-dong, is this the right bus to take for us? Yes, this is the right bus. Just get of the bus at "Myeongdong Station". Hi, I will be staying at Hotel Skypark Central. I got to know from the hotel website that there is an airport limousine bus stop near the Skypark II, which is a block next to Skypark Central. Will the 6015 airport limo bus stop here? And as what I seen here the Euljiro Station seemed to be nearer to the hotel. You can get off the 6015 airport bus at Seoul Royal Hotel(Uljiro). Hotel Skypark Central is just behind Seoul Royal Hotel. Hi we are planning to stay at small house big door. Which bus should we take? Hi Ann_N, The nearest bus stop I am aware of is the 6015 Bus from Incheon that stops at Ibis Ambassador Myeongdong Hotel but Small House Big Door is a few hundred meters of walk and passing a cross junction from here. I am interested to book Tria Hotel, but am not too sure if any shuttle bus goes to and fro from Incheon Airport - if there is, which bus is it? And do you know if any shuttle bus or regular bus around the hotel goes to Gimpo Airport as well? Thank you! Hope to hear from you soon as we're kind of doing this last minute! Tria Hotel is in Gangnam, far from Myeongdong. You can take take KAL Limousine Bus 6703 to Renaissance Hotel (TRIA Hotel). However, as far as I know, this bus does not stop at Gimpo Airport. If you were to take bus 6015 from Incheon Airport to Myeongdong, you can alight at "Myeongdong Station" in front of Skypark Hotel Myeongdong III and then walk in down hill direction for about 200-300 meters. Days Hotel should be on your right. We are staying at J Hill hotel at Myeongdong-gil, Jung-gu, Myeong-dong. Decide to take Limousine 6015 back to Incheon airport when depart. Wonder how long does the journey from Myeongdong to Incheon airport by bus? Flight on 11am, so what time I need to start my journey. Thank you. 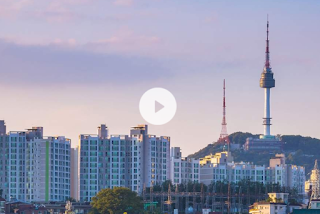 Two questions : Is it better to stay at Ibis Myeondong or at the Grand Hotel Myeondong? I see that the airport bus stops at Ibis but if I stay at Grand Hotel where do I get off? Both are considered good international hotel at Myeongdong. If you stay at The Grand Hotel Myeongdong, you need to get off at "Myeongdong Station" bus stop and walk for less than 100 meters. The Grand Hotel is not on the main road but at the back street where Myeongdong shopping area is located. Hi, I will be staying at Gogo House Incheon. How do I go to Myeongdong for shopping? Gogo House Incheon has a free shuttle bus to airport. I think the easiest way is to take that bus to airport and then take the airport shuttle bus to Myeongdong which is described in the this article. Thank you for these useful information!! :) But does this bus operate on Sunday? Yes, the airport shuttle bus to operates everyday. Hope this helps. Enjoy Myeongdong, Enjoy Seoul. Yes, you can take AREX train from Incheon to Seoul Station and then change to subway Line 4 to Myeongdong (refer to details in my ohter post: http://www.myeongdong.org/2013/11/arexsubway-train-from-incheon-airport.html). However, Myeongdong Subway station is quite a distance from Ibis Ambassador Myeongdong. You may consider taking bus 6015 from Incheon that stops right in front of Ibis Ambassador Myeongdong. Maybe to reach IBIS ambassador myeongdong better to get off in Euljiro (1) ga Station.... I want to ask where's better location and access bettwen IBIS SEOUL AMBASSADOR MYEONGDONG ( http://www.ibis.com/gb/hotel-6317-ibis-ambassador-seoul-myeongdong/index.shtml) or IBIS STYLE SEOUL AMBASSADOR MYEONGDONG (http://www.ibis.com/gb/hotel-6317-ibis-ambassador-seoul-myeongdong/index.shtml).......???? the nearest bus stop I know is to alight at Best Western Gookdo Hotel(Uljiro 4-ga). Then walk for some 500 meters towards Uljiro 3-ga station. Shold be ok to follow Sutton Hotel walking direction from the bus stop. Hello! Will I be allowed to use the bus even if I have two suitcases with me? Arriving on January 21 and ai have a lot of bulky clothes. Will they ask me to use a taxi instead? Please advise. Thank you. Looks like you are staying at the same hotel in Myeongdong as Cherie Chong (see last two comments before yours). You can refer to the answer given. Enjoy your trip to Seoul. I will arrive Incheon airport at 23:00, and by the time I pick up my luggage, it would be at least 23:30. Which transportation can I take at that hour to Myeong Dong? Thanks. In my opinion, the safest option maybe taxi. You can also try to take the all stop train to Seoul Station (55 minutes, the last train depart 11.4xpm). The last train depart from line 4 Seoul Station to Myeongdong is 00:44am. A bit rush depending on how fast you can clear immigration and collect your luggage. Hi, thank you for the information, really helpful. Yes, actually both bus 6001 or train via Seoul Station will take you from Myeongdong to Gimpo Airport. You may find bus from Myeongdong station to Gimpo more convenient since you have bulky suitcase. If you take train, there is quite a bit of walking at the Myeongdong subway station and when changing line at Seoul Station. Enjoy your trip! strongly recommend you to take airport bus to Seoul instead of train ,since u are the only single lady with suitcase ...i travel Korean 3 times atleast in a year , so i have experince that ,in seoul almost all their Subway station except of their main entrance with elevator ,after you go in the station ,there dont even have elevator !!! and if u go a wrong way ,you u have a SUPER hard time to carry your suitcase ,because all they have is just staircase inside . i have this very bad experince on my very first trip . and for now airport bus is really doing very well and convineint to access to everywhere in Seoul . Ninetree Hotel is nearer to the "Myeongdong Station" where the airport shuttle bus stops (less than 50 meters). It is also nearer to the the "Myeongdong Subway Station". The new hotel Loisir hotel seoul at Myeongdong , any airport shuttle bus stop at that hotel? For Loisir Hotel, you can take the same bus 6015 and get off at the same "Myeongdong Station". Then walk in down hill direction for about 200 meters to get to the hotel. Comparing the 2: will Loisir be nearer to where all the actions are in Myeongdong? Metro will be a better choice? Myeongdong is a large shopping district. Both areas around Loisir and Metro are equally happening but personally I would prefer area around Loisir. Moreover it is very near the subway for me to go everywhere else in Seoul. Thanks for your advice! You are a geat help! So glad to chance upon your website! I'm going to stay at Loisir Hotel. Which stop should I get off? Thanks. You can get off at "Myeongdong Station" too. Just in down hill direction for about 200 meters and Loisir Hotel should be on your right hand side. I will be staying at STAZ Hotel Myeongdong II. Which stop should I alight? I believe the nearest station to alight is still Myeongdong station but you need to walk a bit to the hotel, maybe about 1km. Hi, we'll be staying at hill house hotel, which stop should we drop off? And also directions to reach the hotel pls... Thanks! To my knowledge, Hill House Hotel is very far from Myeongdong Station. The nearest station I can think off is at Namdaemoon Market(Bank of Korea). The direction from Bank of Korea to this hotel is also quite complicated to explain. I suggest you look up Google Map for direction from Bank of Korea Namdaemoon to Hill House Hotel to get a good view on the map. Hello! My friends and I will be staying at Hotel Bonbon. If we are to take Airport Bus where do we drop off? I think it's kinda far from Sejong Hotel. Can you help me on this? The nearest bus station I am aware of is "Ibis Ambassador Myeongdong Hotel" station. However, you have to walk some 300 meters in north direction across Eujiro 1-ga junction to get to Hotel Bonbon. Hope this helps. 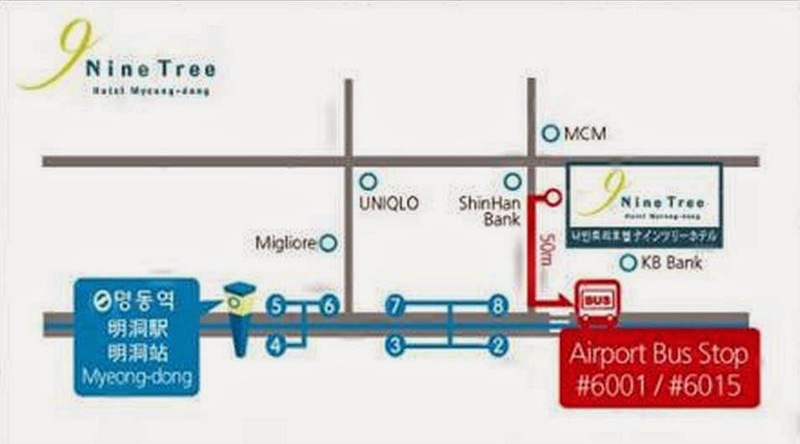 Nine Tree Hotel, Skypark Myeongdong III and Sejong Hotel are the nearest to 6015 bus stop. I will be staying at Ekonomy Hotel Myeongdong Premier. Which bus station should I get off from bus 6015? Just get off from airport bus 6015 at "Myeongdong Station". You can refer to my reply above to Jenny Tan on 27 Oct 2014 for the walking direction to the hotel. Enjoy your stay in Myeongdong! What is the walking distance from Sejong Hotel and Myeongdong Station exit 10 to Staz Hotel Myeongdong 2? Thank you. Will be traveling 2 March and appreciate your advice very much. My guess would be something like 500 meters. Walk-able if you don't have a lot of baggages. May I know the best route from Incheon Airport to Hotel J Hill Myeongdong? How much are AREX & bus fares? Thank you. Hi i am meann, will be staying at seoul city hotel 69, Toegye-ro 4gil, Jung-gu, Myeong-dong if will take a ride from incheon airport bus 6015 which is the nearest drop off and please help us how can we reach the hotel.thank you. Hi Meann, I hope the map at the bottom of Namdaemoon Guesthouse page http://www.guesthouseseoul.kr/location_bus.htm can help you. Just get off from the 6015 bus stop at the Namdaemoon Market and walk following the direction on the map. You should see Seoul City Hotel before turning for the last arrow. Hi, how far is seoul royal hotel from the 6015 bus stop. I will be traveling with 2 young kids. Hope it will not be too far a walk. Hi Bam Bam, I checked the hotel website. They have free shuttle bus direct from the airport to the hotel http://www.royal.co.kr/2014_renew/en/access . Maybe you can check and contact them to reserve your seat if the schedule suit you. The nearest stop for 6015 that I know of is the Ibis Ambassador Seoul Hotel but the walking direction is not very direct. Hi, once we get off at Hoehyeon Station what would be the most convenient way to go to Hill House Hotel? I have read some blogs that directions, especially for first time tourists might be tricky. Could you provide me a map that can assist us? Thanks! Hi Jeric, you can find the direction from Google Map link below. Another option is to take bus 6015 from Incheon Airport direct to Myeongdong Station, and then take a short taxi ride from Myeongdong Station to Hill House Hotel. Hi, may i know what bus need to take from incheon airport go to ekonomy central myeongdong hotel and stop at which one station? how about walking distance between the station and hotel? and how about if we go by train? which direction we need to take? thanks in advance. hi chicken share thx for the reply. need to ask again. then i should take what number of bus from incheon airport? Just take the same airport shuttle bus 6015 at Incheon Airport as described in this article. At Incheon airport, normally the bus driver come off the bus to open the under compartment for passenger to store their luggage. Bus driver will also come down to assist anyone with wheelchair. You will need to ask for help if you need the bus driver to help with your luggage. There could be some communication problem here because most bus driver don't speak or understand English but please persist and don't be afraid to ask fellow travellers for help as well if you can't get the assistance you need. On the other hand, taxi driver will certainly help with luggage. 1. At which bus stop I should get off? 2. How can I go from bus stop to the hotel? 3. On the way back, I can take the bus at the same bus stop and buy the ticket from the driver, right? You could get off at Myeongdong Station, same as described in this post. From the bus stop, walk in the slightly uphill direction for for three blocks (about 200 meters, you will walk pass Sejong Hotel on the way). Then turn left into Samil-daero and walk for about 100 meters or so to reach Ibis Style Ambassador Myeongdong. It's a very new hotel! Yes, on the way back, you can take the bus from the same stop and buy the ticket from the driver. By that time, I believe you will be very familiar with the area around Myeongdong Subway Station. Enjoy you time in Seoul! If i stay at Hotel J hill & taking bus 6015 from airport, which bus station should i get off? You can get off at "Seoul Royal Hotel(Uljiro 1(il) ga)" Station, which is one station after Ibis Myeongdong Staiton. Walk toward Myeongdong gil main street. We are staying at Hotel Shinshin, 17-5, Namdaemun-ro 5-gil, Jung-gu. Where should we get off? We would like to walk to our hotel if it's not too far. I'm staying at Hotel Bonbon and taking bus from incheon airport,. Can i know where to get off? How when i'm going back to airport? Is it myeongdong station in walking distance? You can get off from Euljiro 1-ga Station, the hotel is about 240 meters from the station. You can catch bus 6015 at the same station to go back to airport. Myeongdong Station is far from here. If you want to take the subway to go around seoul, use Euljiro 1-ga Station (Exit 2). Do you know which stop i should get off at for Good Morning Parktel? Hi there, am planning to stay at Hotel MIDO Myeongdong, which stop should I get off from the 6015 bus from airport? Its my choice of accommodation ok? I think the nearest 6015 bus stop is the Namdaemoon Market. Hotel MIDO is half way through to Seoul Guest House after crossing main road (refer to the map at the bottom of http : / / www . guesthouseseoul .kr / location_bus . htm). It is a bit far from Myeongdong Subway Station but near to Hoehyeon Subway Station. I will be staying at the Pacific Hotel. Should I take bus 6015 from Incheon Airport? Where should I get off and how do I walk to the Pacific Hotel? thank you very much for the info. it's very appreciated!! The first bus departs around 4.50am from Myeongdong. You can check with the Ninetree hotel front desk person to confirm this. If you want other arrangement like taxi, they can help you to prebook as well. 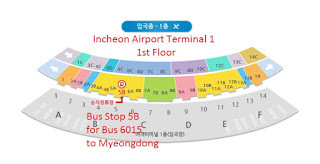 hi chicken share is the bus station (for bus 6015) to incheon close to nine tree hotel? or do i have to go somewhere else to catch the bus? It is very near (about 50 meters). You can see the last picture on the above post. It is the bus stop when you arrive in Myeongdong. Hi I'm Rachel. May I know how I reach Tomo residence (TOMO RESIDENCE (토모레지던스) – 51, Myeong-dong 8ga-gil, Jung-Gu, 100-860 Seoul, South Korea. 서울특별시 중구 명동8가길 51 (충무로2가) from Incheon airport? take bus 6015 to myeong dong? which bus stop I should alight? infront of Sejong Hotel? Yes, you can get off the bus at "Myeongdong Station" too. After that, cross main road using the zebra crossing. Then go into the small street beside Prince Hotel. Mom House is about 50 meters from the street entrance. Hello, just checking but there is a tmark hotel stop for bus 6015 right? And where do we we exactly get the bus ticket from? You can get the bus 6015 ticket at the airport arrival hall as described in this blog post. Enjoy your stay in Seoul. Hi, I'm Ann. I'll be staying in a guesthouse near Pacific Hotel and would like to go to Gimpo Airport via airport limousine 6001. 1. Do I wait for the bus in front of Sejong Hotel as well ? 2. In my opinion bus should be more convenient for you. You can depart a little bit earlier if you do not mind. Hello..... I'll be staying at guesthouse myeongdong 2 ...should I take 6015 bus from incheon airport? Where should I get off and how to walk to guesthouse myeongdong 2? The map shows chungmuro station is nearer...is there any bus can reach there? For Guesthouse Myeongdong 2, some walking is needed from the bus stop (be it Myeongdong or Chungmuro station) because the bus does not stop exactly at this hotel. Hi, I'm staying at k-guesthouse 2 myeongdong. How do I get there from the airport and is it far from the bus stop? Yes, you can alight at Myeongdong Station too. The hotel is within walkable distance with luggage, about 100 meters. You can refer to the map on agoda http://www.agoda.com/k-guesthouse-myeongdong-2/hotel/seoul-kr.html -> (Show map). The bus stop is between EXIT 8 and EXIT 9 of Myeongdong Subway Station. Hi i will be staying at Staz hotel myeongdong 2.
would like to check on which station to alight from airport shuttle? What's the walking distance with luggage from airport shuttle station to staz hotel 2?thanks! I believe the nearest is still Myeongdong Station but you need to walk for about 500 meters or so. 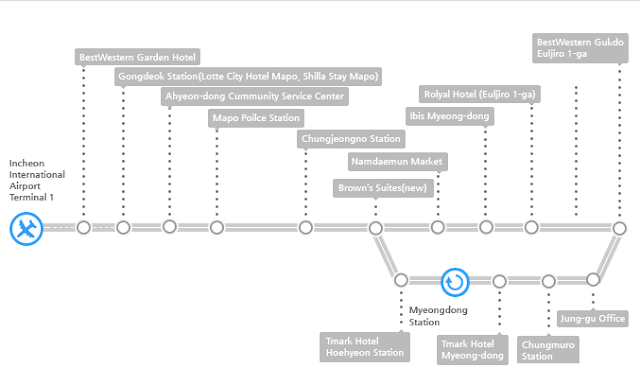 You can refer to the map on Booking.com http://www.booking.com/hotel/kr/staz-myeongdong-2.html (click show map). Myeongdong Station bus stop is located between EXIT 8 and EXIT 9 of Myeongdong Subway Station. Hope this helps. Enjoy Myeongdong! Thanks! I would be switching hotel from staz hotel myeongdong 2 to ramada encore dongdaemun on the 4th day of my tour. What's the most convenient way of traveling over? I will be bringing 2 kids with luggage. Wonder if it will be costly if we go by taxi. .
Hi, I will be staying at N Fourseason Seoul Hotel (100-49, Hoehyeon-dong 1-ga, Jung-Gu, 100-051 Seoul, South Korea). Would like to check if 6015 is the right bus to take? Yes, you can take the airport limousine bus but it does not stop exactly at the hotel. You can refer to the hotel web http : / / www . nfourseason . com / eng / about / map_big_01 . html . It seems that they offer pick up service from various locations in Seoul. This is a new hotel. I believe Bus 6015 does not stop exactly at Stay B Hotel. You can either get down at Myeongdong Station or Chungmuro Station and walk for a few minutes (Chungmuro Station is probably nearer). Yes, the airport shuttle bus from Incheon to Myeongdong will be operating on Sunday (7 days a week). You can alight at Myeongdong Station if you are staying at K Guest House Myeongdong 2. Hello, which stop should I take just to go shopping at Myeongdong? I am only in transit for a few hours. Hi, please help me. I stay at J Hill Myeongdong, where should i get off from the 6015 bus? Is it possible by bringing 2 luggage by walk to the hotel? How far is it? Then where should i get the bus to bring me back to Inc Airport? Hi, which stop should i get off on 6015 if staying at Hotel New Oriental Myeongdong? Thanks! Hi, which stop should i get off on 6015 if staying at Holiday Inn, Seoul , Euljiro? Thanks! Hi Noraini Mohd Arom, as far as I know, the nearest station to alight is BestWestern Gukdo (Euljiro 1-ga) but you need to walk backward for about 300-400 meters to Girls Generation Hostel. Notice that BestWestern Gukdo is a hotel. Welcome and enjoy Seoul! Hi chicken share, is Best Western Gukdo have 2 hotel? As i see in the map the hotel located at Euljiro 4-ga...or is there another hotel at Euljiro 1-ga? Sorry for asking again. Thanks for the wonderful write up and guidance for tourist that visiting seoul. I will be staying in New Oriental Myeong Dong hotel. From your blog, the airport bus will stop near myeongdong station and i would like to enquire, do i need to walk alongside the road to my hotel or there is underground path in the subway that i need to walk to go to the hotel. Really appreciate your advice. Hi, We will be staying at Sieoso Hotel (320, Euljiro 3-ga, Jung-gu, Myeong-dong ) which stop should we get off fro bus 6015? Thanks! You can get off from bus 6015 at Royal Hotel station, but you have to walk for about 15 minutes to Sieoso Hotel, which is in the alley after EXIT 11 but before EXIT 10 of Eulijiro 3-ga Subway Station. If we want to go to Myeongdong Cathedral and will be taking bus 6015 from airport, which bus station should i get off? You can get of bus 6015 at Myeongdong Station too like in this post. then, walk along Toegyero-gil street for about 300m until you see Myeongdong Cathedral on your right. Turn right at the intersection then walk towards Myeongdong Cathedral. You can ask people there if you cannot find the direction. I'll be staying at Ekonomy Hotel Myeongdong Central. Which bus station should I get off. How far/how many minutes of walking distance? Thanks in advance. Hi, your blog is really informative. Do you think it makes sense to take either a AREX or Shuttle bus to Seoul/ Naedaemum stop and then get a TAXI down to the hotel? Will this be cheaper and convenient? How do you think it's the best way to approach this? I am travelling with my husband and a child. Thanks! Welcome to Seoul. Actually Namsan City Hotel is about 600 meters of walking from Namdaemun Market Station for Shuttle Bus 6015, but the walking direction is not straight forward. So you may want to take a taxi to your hotel from the bus station. Namsan City Hotel is also very near to EXIT 3 of subway Hoehyeon Station (only one station from Seoul Station). So you may consider change line to subway line 4 at Seoul Station to go to Hoehyeon Station too. If you have a lot of baggages, bus and taxi is better than train and subway because you need to go from underground to ground. Hope this helps. Enjoy Seoul! Hi, MANY THANKS for the info! We have used the 6015 before, while getting in and out of Seoul - very convenient, and cheap. Used to take cabs before, and can't recall how much they cost, but nothing that is only US$10! I would also add that the Seoul City tour bus is also very useful for first timers in Seoul - you can absorb everything interesting in the 2h? ride and still hop on and off for the rest of the day. QUESTION: We're flying into Seoul again very soon - while reasonably-priced, our flight doesn't get in until AFTER 10.30pm~ 11-ish = is the 6015 bus still available then? What would be the next best cheap alternative? Heading from Incheon into Myeondong - would appreciate a Plan B and C for getting there, without having to bust the bank. Much Thanks! Helpful suggestion for the near-Incheon hotel stay, and thanks for info on Hotel Queen. 1) How much to expect on fare? 2) I vaguely recall there are cabs to avoid as they're more exy - which ones? Can i know the airport limousine frequency from myeongdong station to incheon airport? Does the shuttle bus also comes by every 20-30minutes? Yes, it is the same frequency as bus from airport. Very convenient. Enjoy Seoul!